The Golden Retriever originated in the 1800s by cross breeding a yellow flat coated Retriever with the now extinct Tweed Water Spaniel, then later crossed with a Bloodhound, Irish Setter, and more Tweed Water Spaniels. The dogs were called the Gold Flat-coat and only later named the Golden Retriever. 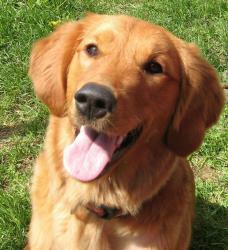 The Golden is a lovable and well-mannered intelligent dog with a great charm. They are easily trained and always gentle with children. Charming, devoted and self-assured, they are a great family dog. The Golden Retriever is friendly with with everyone, including other dogs and have very little, if any, guarding instincts. While very unlikely they will attack, they make a good watchdog. This breed needs to be around people who display leadership to be happy. They may become destructive or high strung if they do not have enough daily mental and physical exercise. Some of their health problems may be hip dysplasia, Von Willebrand disease, heart problems, congenital eye defects and cancer. Skin allergies are common and often require veterinary attention. Weight gain is common, so do not over feed. The Golden Retriever needs to be taken on daily brisk, long walks and they will jog or run alongside you on a bike. Be sure to exercise this dog well to avoid hyper activity.